The past few years I have seen many new web sites now on the subject on restoring. Just like everything else, once something becomes popular people try to cash in on it. I have seen everything from fake foreskins that you can wear to creams that claim you can cut your restoring time in half. ( Medicinal Leech ) I'm not saying all these products don't have some good benefits. But I know when I see phrases like " The best , fastest, easiest way to restore yourself" I can be pretty sure I am being sold something that really isn't. It's like seeing late night TV ads on exercise products that promise amazing results but only end up being something you throw out three months later. The bottom line is there is no "Best" Product out there ! Everybody needs and lifestyles are different. The best advise I can give to anyone restoring is to find a couple of methods to restore yourself that will fit your lifestyle. Restoring does not happen overnight. It takes time and dedication to achieve your goal. So please read everything you can on the subject of restoring. Educate yourself and use common sense to help you choose what will work best for you. This sites main goal is just to show others that restoring can be done! If you feel a DTR will help you achieve your goal or just have a question on restoring then contact me and I will answer any question you have. There are some ideas on restoring that sound good in theory but if you think about them logically it does not make sense. Take the taper of a device. Whether it is a bell or cone it really does not make a difference. At first thought you would think that a device with a smaller cone taper would make the end of your restored foreskin tighter. I really don't see this as being possible since I am taking my shaft skin and pulling it to force skin growth. This is the basic premise for restoring. Looking at the pictures on the right you can get a better understanding on what I'm saying. 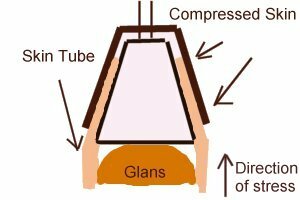 The area of compressed skin is simply being held in place by a gripper or tape while the shaft skin is being stressed by means of tugging or bi-directional tugging (like the DTR). Skin does not grow inwards onto itself as you would hope it would. 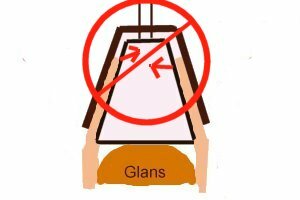 Remember we are taking existing skin that we have now and making it longer so it covers the glans. A real foreskin has what is referred to as a frenar or rigid band. This is at the end of a foreskin that is tighter and has an elastic like look to it. Some foreskins are longer then others so it is not unusual for even uncut men not be fully covered by their foreskin. This is why there are many uncut men using restoring techniques to gain more skin. I still have not seen any evidence that shows the shape of a restoring device contributes anything to tightening the end of the foreskin. 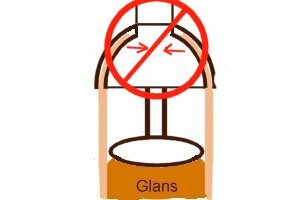 After years of viewing pictures or restored men and my own personal experience I now think that the shape of a persons glans and how much skin they grow is what creates the " taper ". The more skin that is grown the better the end result. In my own personal experience the only thing I have done to create a taper or tighter end to my foreskin was the use of O-rings. 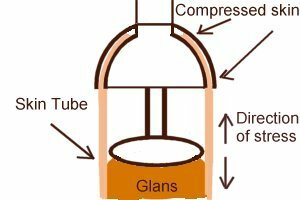 check out O-ring theory for more. My conclusion after viewing pictures and hearing from 1000's of restoring men throughout the years is that the slight difference in the shape of restoring devices does not appear to have any significance with the taper of a restored foreskin. The exception would be if someone is using a device that is outwardly expanding the skin due to it being to large for the user. One more thing to keep in mind is that when a person is restoring the skin is loose from using restoring methods. This loose skin normally tightens up after restoring or stretching has stopped for a week of two, This time can vary from one person to the next and many will experience this on a daily basis just as I did. I am currently testing a new way to retain using " The Keeper " to see what long term effects it will have on my skin.